Could a cast net design be better? The answer is yes and Betts Cast nets have done it with their new Series the Morada. Ok you ask how is this cast net different??? Designed by the Florida Keys legend “Frank the net”, when you’re casting a Morada you’re casting a legendary cast net design. Designed and constructed to create a bond between the fisherman and his net. Here is a few of the features that make this net better and when I say better I mean like much easier to cast larger net sizes; like eight, ten and twelve foot size nets. 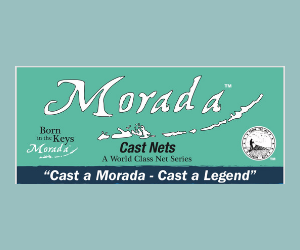 The Morada series was designed for easier casting of larger nets and still with a super fast sink rate. Six panel “Frank the Net” Design; the panels are cut exact size in length and width based on the legendary custom design of Frank the net with an extra 6” of netting sewn in to allow Morada nets to achieve more spread. When compared to other nets Morada achieves an extra 8” to 12” of spread per-cast. Lead weights; 1.60 pounds per foot of lead. Small marble weights tied at exact measurements ensure the net opens and closes uniformly, no lost bait. Long weights tied on large mesh nets (5/8’ & 1”) ensure no tangles with a super fast sink rate. Netting; Morada netting combines strength and softness to find the perfect balance. Morada’s are constructed out of a premium high grade monofilament. Soft netting fits easily in ones hand when net is fully loaded, but still strong enough to pull in large bait loads. Lead Line; tightly woven with color that blends in with the water. Knotted together and crimped to make sure the lead line holds together. The lead line is tied with a secondary lead line interwoven for added strength and minimal wear at stress points. Horn & swivel; the horn made to correct size to prevent losing bait, but large enough for easy movement of the bridle lines for ultimate spread. A very strong saltwater rated bronzed swivel to pull in full net loads of bait. Bridle lines & Morada tubing bridle divider; bridle lines made with premium mono tied every 25 inches for balanced performance when the net is closed. This helps minimizes bait loss when closing the net. Unique to Morada bridles are divided with tubing for easy separation and less tangles. Hand Line “pull line”; thirty-five feet (35’) of water colored blended super strong yet soft hand line included with all sizes of Morada cast nets. I have a ten foot 1/2” mesh Morada net on my boat everyday and let me tell you this net really is easier to cast. I use to throw eight foot net for bigger baits but now the ten foot throws as easy as my older eight foot that is not a Morada cast net. I’ve saved the best for last…..how about a Limited Lifetime Warranty on a cast net?!?! If the net is ever damaged (even it’s your fault) Betts will replace the Morada net for 50% of the MSRP. All info on the warranty is included with every net purchased. That’s a pretty good cast net warranty I’d have to say. We all know what can and will happen to a cast net!